Fabrice Poussin teaches French and English at Shorter University, Rome, Georgia. Author of novels and poetry, his work has appeared in Kestrel, Symposium, The Chimes, and more than a dozen other magazines. His photography has been published in The Front Porch Review, the San Pedro River magazine and more than sixty other publications. Erin Ollila: What’s the story behind Single? Fabrice Poussin: I was in New Mexico for seven weeks, and of course, heard of White Sands National Monument. I was working evenings, and decided to take every morning to discover the sites. In the end I spent some 30 hours (on different days) walking the sands, and looking for images I had seen before in books. I wanted to capture the beauty of solitude, and that is what I found with many of the plants there. This is one of these examples. Erin Ollila: One of our contributors said, “There’s a lot of motion in the foreground that I find compelling, particularly because of the tension between that motion and the looming stillness of the sky/that cloud.” Were you planning on the juxtaposition of stillness and tension when you took this picture? Fabrice Poussin: I don’t know that we ever plan anything. That said, I was looking for the motion of the sand waves, as the sands in fact do move. I shot with a maxim f-stop so I could catch that depth. Most of all that is what I wanted to capture, the depth, mystery and power of the stillness of the scene. Erin Ollila: What made you submit this in black-and-white? 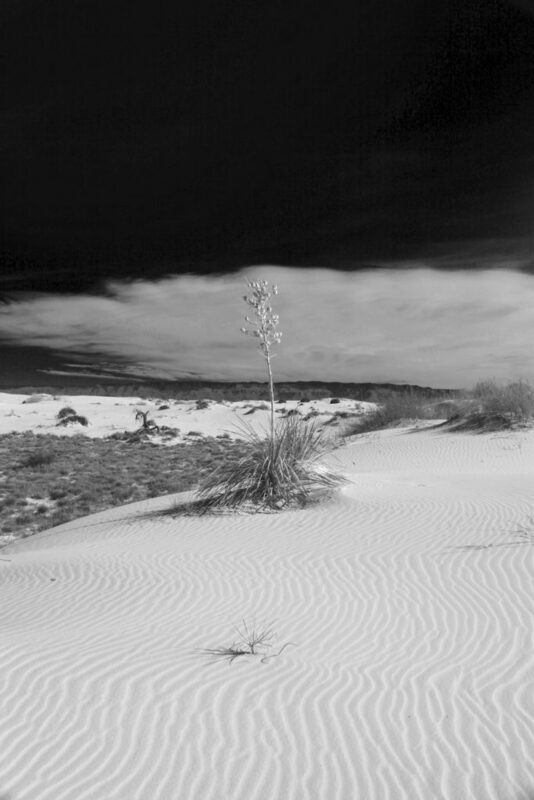 Fabrice Poussin: Shots are also very dramatic in color at White Sands, whether they are of the blue skies, and white sands, or of the white clouds and white sands. I believe the scenes can be much more dramatic in black and white, and I believe this specific shot most likely due to the feeble appearance of the plant, show that feeling of estranged solitude even better. Erin Ollila: What about photography speaks to you? Do you work in any other creative mediums? Fabrice Poussin: I always look for the detail. That could be a rusty nail on an old door, or the fallen petal of a flower. I aim to show simple scenes to share the feeling that moved me in the first place, be it colors, simple geometric shapes, abandoned objects. I would like for the viewer to ask themselves what the image may have meant to someone else (not me), who may have lived there, left something behind, perhaps felt a certain sadness. The intention is to provide a sense of catharsis to the viewer. I also write and publish poetry, have written and publishes novels, and even tried my hands at oil painting at one point. Erin Ollila: What is your workspace like? Fabrice Poussin: My workplace takes on different shapes: indoors, in the studio, and it is sometimes neat sometime avery messy. There is also the office, where I do most of my computer and printing work. And last but not least in the world, as much of it as I can get to. Erin Ollila: What inspires an idea? How do you take an idea from inception to creation? Fabrice Poussin: At times the idea is inspired by works I have found in books, often I simply try things until something looks appealing. In the studio I may decide to work with flowers, vegetables or books. Then I met see an object I did not plan on using, and once I have tried it I realize it adds to the image, and then I include it. One could say that I let myself be guided through the process by the environment. Erin Ollila: How has your artwork evolved over time? What have been the most challenging obstacles to overcome in your work as an artist? Fabrice Poussin: I would say that my work has become a lot more cleaner, a lot more focused, although it keeps on evolving. The greatest challenge is to realize that it seems there is always someone who sees something I have not seen, and wish I had. Erin Ollila: Are you working on any projects currently that you’d like to share with our readers? Fabrice Poussin: Indeed I have been working on a project with frozen things. I have in fact taken objects which I have placed in water, and photographed. I have also worked on a found object series, using an old window I discovered by chance in an abandoned barn. Erin Ollila: If you could turn the world onto one artist, who would it be? Fabrice Poussin: That may be a cliche, but at the moment I would have to say Ansel Adams. Erin Ollila: What’s the name of your favorite book, author, or poet, and why is this book (or person) so close to your heart? Fabrice Poussin: That is the easiest question: “The Flowers of Evil,” by Charles Baudelaire. His poetry is unbelievably precise. I also wrote my dissertation on the poems. He has a sad, but very accurate view of our modern days. Erin Ollila (née Corriveau) is an emotional archaeologist who graduated from Fairfield University’s MFA program with a concentration in creative nonfiction. Her writing has been published in Lunch Ticket, Revolution House, Paper Tape, (em): A Review of Text and Image, RedFez, and other awesome literary journals. Her blog, Reinventing Erin, is her outlet for ruminating on the minutiae of everyday life.